ATHENS, Greece -- The neighborhood of Exarchia in central Athens has always been home to those who fight the system. Andreas Zafeiris, who opened a “People’s Republic of Donetsk” office in the neighborhood of Exarchia, pictured, in central Athens. 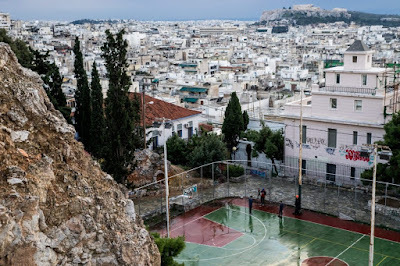 Before Prime Minister Alexis Tsipras’ left-wing Syriza Party came to power in 2015, groups of police would stand on street corners bordering the area, riot shields at the ready, waiting for the streets to erupt into one of the area’s periodic fits of violence. Syrians, Afghans and Africans; pirated DVDs, cannabis and cocaine, you can find just about anyone and anything on the central square — except ATMs, symbols of “rapacious capitalism” that the anarchists long ago firebombed out of existence. About 50 meters down the road from the square, No. 52 Themistokleous Street — named for the naval commander who defeated the Persian fleet in 480 B.C. — is, like most buildings in Exarchia, smothered in graffiti. On a background of orange and black, a cartoon cat smiles at passers-by. The words “Anti-Fascist Empire Zone” are written repeatedly from top to bottom in the background. It fits in well with its surroundings. Just a few doors down, “Bash the Fash” banners hang off a building, with the anarchist symbol prominently displayed. A few bearded men are lying out on the balcony. Inside, the hallway is filled with a variety of alternative-looking young men and women; piercings and tattoos abound. The People’s Republic of Donetsk (DNR) was formed, along with its sister People’s Republic of Luhansk, in the spring of 2014. Backed by Moscow, the pro-Russian groups seized control of central administration buildings across eastern Ukraine, including in the region’s capital, Donetsk. Their goal: separate from Ukraine and join the Russian federation. The movement was a backlash against Ukraine’s pro-European EuroMaidan revolution, which led to the ousting of then Ukrainian President Viktor Yanukovych, after he refused to sign a trade association agreement that would have drawn the country closer to the European bloc. Aside from spreading conspiracy theories, Andreas Zafeiris’ group has been involved on the ground in eastern Ukraine. Fed on a diet of Russian TV, many eastern Ukrainians saw the pro-European movement as little more than a coup against a democratically elected leader. After almost three years of fighting the Ukrainian army, the separatists still control large parts of the country’s east. Now, it appears, they are branching out. Andreas Zafeiris, with his blond hair and tattooed fingers, could easily pass for Russian or Ukrainian, although he’s neither. Born and raised in Athens, the fine arts professor has roots in Epirus, in the northwest of Greece. In his free time, he works with special needs children, he says, and also dabbles in journalism and writing. Zafeiris started to pay attention to the political situation in Ukraine in the aftermath of the EuroMaidan protests, he recalls. “For the first time in recent European history we had a government in a European country with a Nazi element,” he says. The uprising in Kiev was part of a series of American-backed “Orange Revolutions,” not just in Europe but in the Middle East as well, he explains. Far-right parties only managed to secure a tiny percentage of the vote in Ukraine’s post-EuroMaidan elections, but that doesn’t deter Zafeiris from concluding that they’re a controlling element in Kiev. “It’s not a matter of size but of quality,” he says. In March, Zafeiris decided to take action. He gathered a group of like-minded people and began to communicate with the separatist group in Donetsk, which granted him permission to open the Athens office. It’s not the first of its kind in Europe — there are offices in Italy, the Czech Republic and Finland. In Athens, the founding members put up their own money toward renting the premises to get the ball rolling. Aside from spreading conspiracy theories, Zafeiris’ group has been involved on the ground in eastern Ukraine. At the start of the war, the Greek office of DNR “tried to collect food and clothes and money to send there; we rented a place near here and used that to collect donations,” according to Zafeiris. It also seeks to support eastern Ukraine’s Greek community. According to Zafeiris, there are more than 90,000 Greeks in the country, almost 80,000 of whom live in the Donetsk region. The group raised money to set up a Greek school and made an agreement with Horlivka University in the Donetsk region to promote Greek culture. Though the Athens office was set up with the permission of the DNR in Ukraine, Zafeiris is keen to emphasize that it’s not an embassy. It lends support to Ukraine’s Greek community and works to counter mainstream media narratives by informing the Greek public “about what is really happening in eastern Ukraine,” he says. The office, which also acts as a community center — dancing and acting classes regularly take place in its mirrored rooms — is made up of six people, who share administrative tasks and handle press and events. All staff are unpaid volunteers. The office is open every day, from morning until the early evening. People come by to ask about the situation in Ukraine, Zafeiris tells me, especially those who have relatives and friends there. For the group, it all comes back to the fight against fascism and what they perceive as a global dominant global order, Zafeiris says. “This Ukrainian situation is an experiment that can be used all across Europe,” he says. “Greece, with a big economic crisis, and in an important strategic location — near Syria, the Black Sea, the Aegean — has a lot in common with Ukraine … That’s why NATO ships are using the Aegean, a Greek sea, like their playground. “We are not idiots,” he says, adding that Russia, Ukraine, and the U.S. clearly have their own plans, ones that the group has no desire to be involved in. “We are not against Ukraine or Ukrainian people,” he adds. Greece is home to around 17,000 Ukrainians, many of whom are unhappy with the opening of the office. “We see this struggle as similar to the fight against Franco. Donbass is the Spain of our lifetime” — Andreas Zafeiris. Anna Maniati has lived in Greece for eight years, and sees the Greek DNR office as part of the “Russia propaganda machine” to show followers that the separatists have international support. Only two MPs attended the office’s opening party. One of them was Panagiotis Lafazanis, an ex-Communist Party member, who broke away from Syriza after it compromised with the EU. He went on to form the even more hard-left Popular Unity Party, which he leads. He and Zafeiris share the same hard-left conspiratorial worldview. Zafeiris is undeterred by the criticism and controversy. “It’s like the Spanish civil war,” he says.